If you watch the news, then you’ve heard about the happenings in and around our planet earth. Headlines announce NASA scientists’ discovery of flowing water on Mars, the rare showing of the red super moon eclipse and the political chatter on the topic of global warming. You may have heard about last summer’s fires blazing across the Northwestern states fueled by extreme heat and drought. But maybe you yourself have experienced a couple of unusually cold winters the past few years. All of these happenings show that our earth and universe is moving and changing. These occurrences and dramatic weather patterns specifically, make us look deeper into the effects and patterns of climate change. One hot topic in the space of climate change right now is this: El Nino. 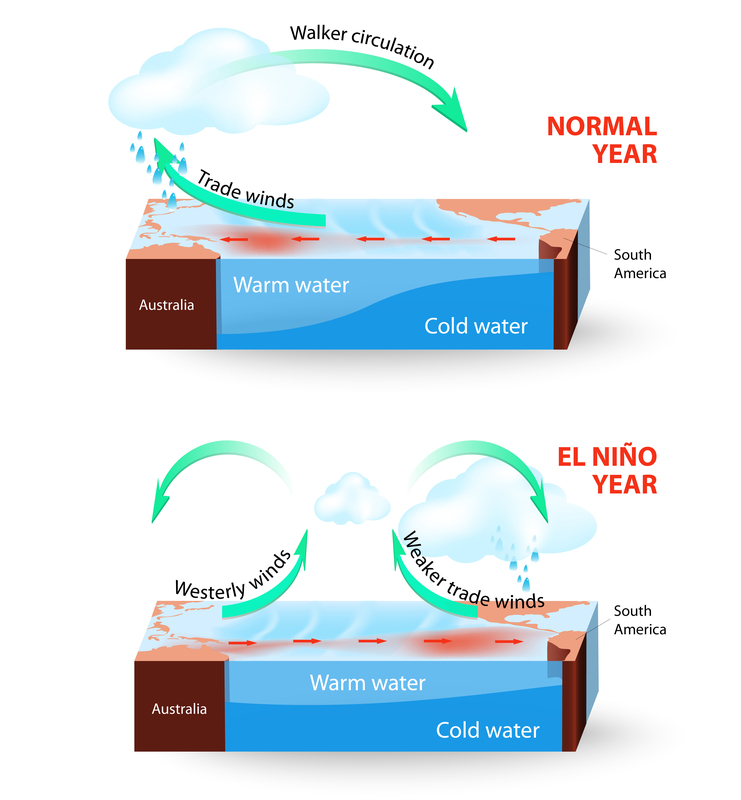 El Nino is an atmosphere/ocean phenomenon that occurs every 2-7 years. During El Nino the equator region of the Pacific Ocean warms up—hotter than usual—for an extended period of time. This abnormal warmth alters thunderstorm patterns, which then, in turn, alters the position of the jet streams. Jet streams are known for bringing in cold artic air from the Polar Regions so when it’s messed with, weather patterns and climate temperatures change. Meteorologists and scientists predict El Nino will occur this December. The last El Nino occurred during the winter of 1997. It’s a domino effect. One thing affects the other but the bottom line is that we will experience different weather for the next couple of seasons. It doesn’t happen all at once—it is said that the effects of El Nino peak during the fall of the following year it starts. The events are also not guaranteed but just more likely to happen. Globally, it’s predicted that we’ll see drought in countries Indonesia, Africa and Australia with flooding rains and warm weather in Peru. In the U.S., California is predicted to see heavy rains, flooding and mudslides. As for our home state of Minnesota, experts predict that we’ll likely experience a more mild winter as historically; this is the effect El Nino has on the upper Midwest. Whether the weather predictions say you’ll be hit with a big change or not, it’s important to prepare for the abnormal weather patterns. Most often, storm disasters are unpredictable making it essential to prepare now for an emergency storm disaster situation.